With its beginnings in the late 19th century, the Cakewalk has become a staple of the early African American dance culture in the United States. This style of dance first found popularity on black slave plantations came about during forms of “prize-walks” in which people would dance or “walk” to receive prizes. 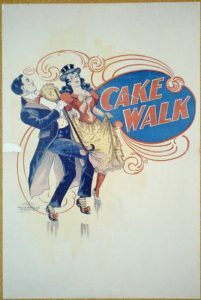 It is called a Cakewalk because at the end of the dance, the winning couple would be presented with a cake as a reward for their dancing efforts. This dance began as a part of minstrel shows and was exclusively danced by men until the 1890’s when women were allowed to participate. recording date is unknown, what we can hear is an example of a simple melody and chord structure with a small brass ensemble. As this dance develops from a minstrel dance into a full fledged art form, we begin to hear transitions in its structure and instrumentation. Here is a recording by pianist Lincoln Mayorga from 1937. In this recording we have just a solo piano, but the rhythmic and harmonic structure are beginning to become more complex while still maintaining its jaunty and consistent driving motion. In modern times, the Cakewalk is not a regularly performed, but modern interpretations have led to this style of music being continued mostly in forms of Jazz, which also has roots in black culture. A prime example of this is this recording by the Oscar Peterson Trio on their album “Nigerian Marketplace”. This takes the final evolution of the Cakewalk. This recording from 1988 keeps the same style with adding a large influenced jazz flair to the music, while still keeping the piano prominent. Cakewalk. 1898. Prints and Photographs, Library of Congress, Washington D.C.
No Cakewalk On The Program For the State Convention of Afro-American Leagues–A Haytian Lecturer’s. March 5, 1890. New York. New York, NY: NewsBank/Readex, 1890. Accessed October 9, 2017. America’s Historical Newspapers. Rusty Rags: Ragtime, Cakewalks & Stomps. Recorded July 1, 2009. Qualiton – Saydisc, 2009, Streaming Audio. Accessed October 9, 2017. http://search.alexanderstreet.com/view/work/bibliographic_entity%7Crecorded_cd%7C1037073. Pianist On Tour. Recorded October 17, 2006. TownHall Records, 2006, Streaming Audio. Accessed October 9, 2017. http://search.alexanderstreet.com/view/work/bibliographic_entity%7Crecorded_cd%7C1019879. Oscar Peterson Trio: Nigerian Marketplace. Recorded January 1, 1988. Pablo, 1988, Streaming Audio. Accessed October 9, 2017. http://search.alexanderstreet.com/view/work/bibliographic_entity%7Crecorded_cd%7C597035. This entry was posted in Uncategorized by Garrett Bond. Bookmark the permalink.